A perfectly baked piece of salmon is a thing of beauty. But getting there can be tricky. In general, the larger the piece of salmon you are cooking, the longer it will take and vice versa. But what does that really mean? The amount of time it will take to cook salmon depends on a variety of factors. 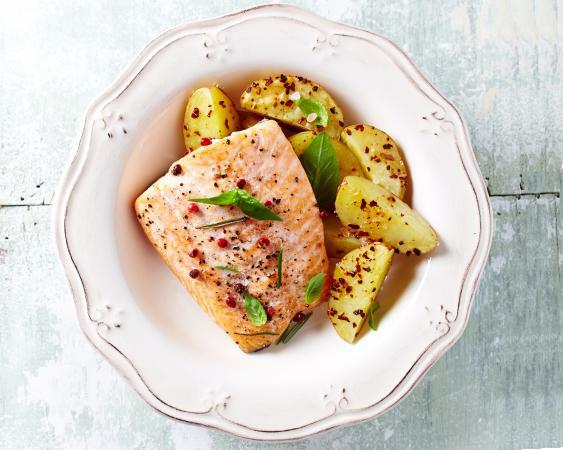 Use these tips to find the right time for your salmon dish. For boneless, skinless or skin-on fillets, heat the oven to 400 F. Bake a 2-inch-thick fillet for 18 to 20 minutes or until the desired internal temperature is reached. A 1-inch-thick fillet will be done in 10 to 12 minutes or when the internal temperature is reached. A bone-in salmon steak should be baked uncovered at 400 F for 10 minutes per inch of thickness or until it reaches the proper temperature. Bake salmon in a closed packet, whether parchment, foil, or a covered dish, at 350 F. It will cook a bit more quickly so start to check the temperature after 10 minutes and re-cover the fish until the proper temperature is reached. How Long Do You Broil Salmon in an Oven? Check the salmon frequently. Start checking at about 10 minutes and keep checking until the flesh of the fish is just barely an opaque pink and the internal temperature you desire has been reached. Remove the salmon from the oven as soon as the flesh becomes opaque. Serve immediately. The internal temperature of any form of baked salmon, when taken with an instant-read thermometer, should register 145 F according to the U.S. Food and Drug Administration. But salmon has almost no collagen and dries out at this temperature. Many restaurateurs, food pundits, and thermometer manufacturers recommend cooking to 125 F.
A middle-ground approach would be to cook to an internal temperature of 130 F. After a 5-minute rest with tented foil, carryover cooking will bring the fish up to 135 F.
Follow the latter two procedures only if your salmon source has an impeccable pedigree. Whatever you do to a lovely piece of salmon, don't overcook it. You'll end up with an extremely dry and unpalatable piece of fish. One of the ways to give yourself a little wiggle room so that overcooking is less likely is to add a little moisture to the pan in the form of white wine, lemon juice or olive oil. Be sure to add a little salt for flavoring. Another way to introduce a bit of moisture that can help avoid drying the fish if it is overcooked is to marinate the salmon before cooking. Fish absorbs marinades very quickly. A 15-minute swim and it's ready to be cooked. Another thing that determines how long the salmon is baked is oven temperature. Typically, recipes for baking salmon call for an oven temperature of between 350 F to 400 F. The salmon should always be put into a pre-heated oven. Cooking in an oven that hasn't been pre-heated can cause drying of the fish. Not only is salmon a delicious food fish, because it is a fatty fish, it is loaded with omega-3s, has a low glycemic index, is low in calories, has cancer-fighting properties, and tons of vitamins. So treat salmon right and it will be your friend for life.